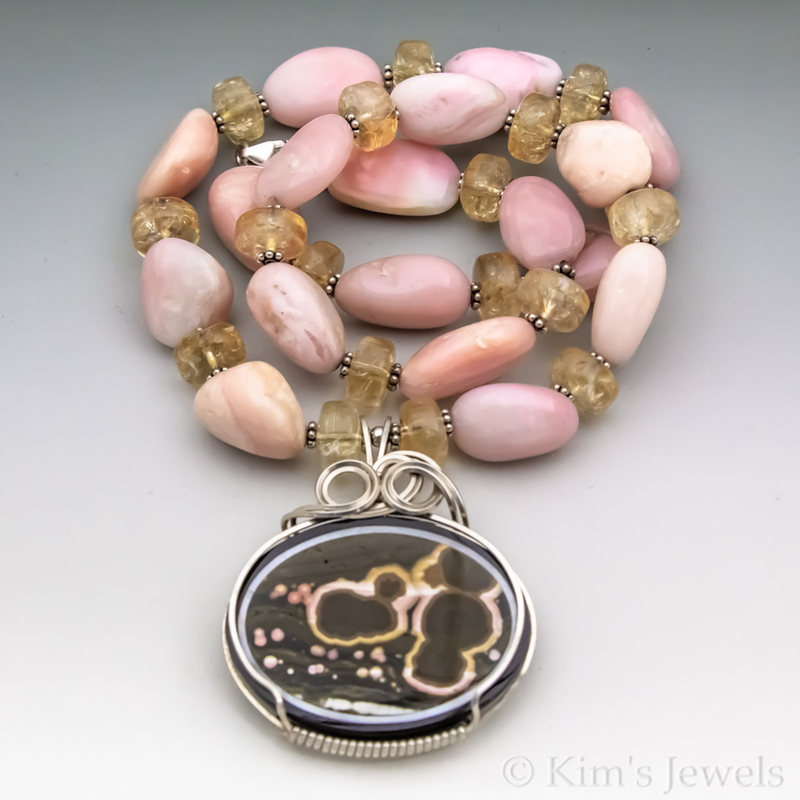 This necklace is hand-crafted with 6x10mm Citrine barrel beads, 12x16mm (roughly) Peruvian Pink Opal nugget beads, and adorned with a uniquely wire-wrapped Orbicular Ocean Jasper Intarsia stone, backed with Serpentine. The photo is enlarged to show detail. All of the accents are sterling silver. 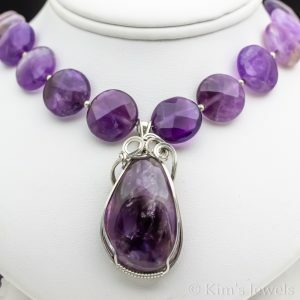 This necklace pictured is the exact one you will receive; it cannot be resized. 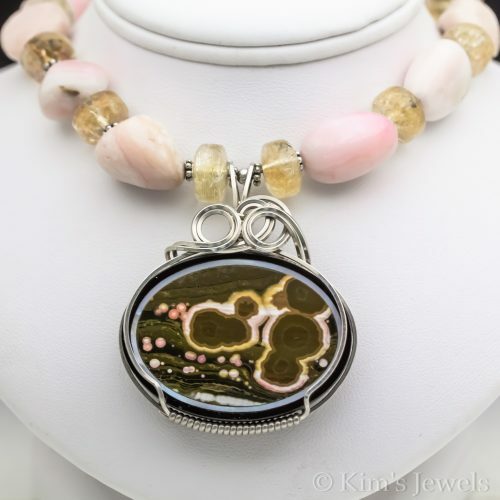 The necklaces measures 19 to 21″ (including a 2″ extender chain). 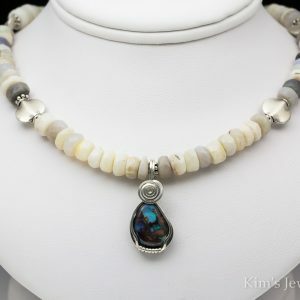 The pendant measures 1-5/8″ x 1-7/8″. 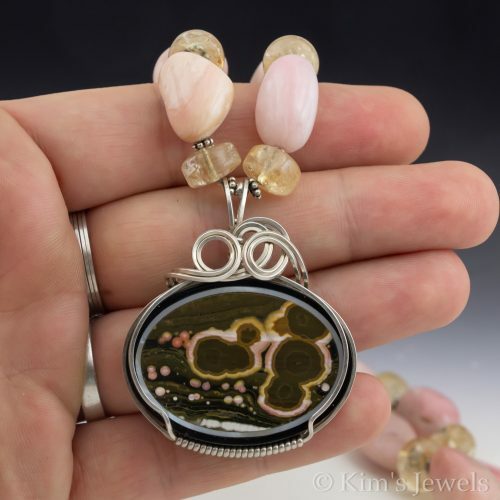 Orbicular Sea Jasper can ease the transition when facing change. It increases concentration and focus while in the body and aids in journeying while out of the body. 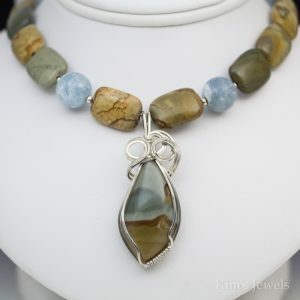 Use Orbicular Sea Jasper to enhance Self Confidence or ease Emotional Trauma. 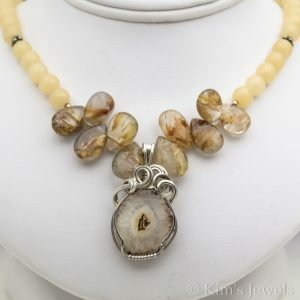 Orbicular Sea Jasper is most often used to connect with Spirit Guides and higher consciousness. Orbicular Sea Jasper also helps to enhance the energies of unity and service to humanity. It will embrace you with complete acceptance and understanding. No judgment here! And that, is what this Pink Andean Opal will help you with in your daily life. Citrine is a stone you truly should not be without simply because the range of issues (physical, emotional and spiritual) it can assist with is incredibly expansive. Citrine is most popular to use for manifestation, abundance and success. But there is so much more it can do! Citrine helps to focus and concentrate. It enhances creativity. It is a motivator and self esteem booster.